Élisée Reclus (1830-1905) is to geography what Michelet is to history, in a century when science expressed itself poetically and concerned itself with politics and humanism as well. An extensive voyager, author of numerous accounts and works including the famous New Universal Geography, The Earth and Mankind, in 19 volumes, Reclus also sympathised with the anarchist movement. Reason enough to be deported and then exiled for his participation in the Commune de Paris. Numerous travels through the Alps inspired his History of a Mountain, a popularising book that also served to reflect on Nature, liberty and progress. Excepts. Fleeing the chaos of the falling Roman empire, Prefect Dardanus had a retreat built in a corner of the French Alps. Protected by a forbidding gorge, his legendary Theopolis prefigured other retreats far from the troubles of the world. Peaceful sites providing asylum that served to colonise many mountain territories. A hiding place or a trap, suited to both defence and flight, mountains offer armies either open or closed protection. An ambivalent nature that the military has had to deal with in these zones that constitute both borders and crossroads and have always been the site of conflict. He withdrew to the « desert », closer to the heavens. On a mountain overlooking the Drôme valley, Benoît the hermit built his four square metre hut with his own hands and lives with a meagre 30 euros per year. Portrait of a believer. Far from the tumult of the world, the maps gallery in the Grande Chartreuse held an extraordinary collection of monumental paintings representing a majority of the monasteries. Executed between the 1600s and the end of the 1800s, they remained little known and very difficult to interpret. It was only very recently that the paintings were added to the list of historical monuments. Something of a free zone, the Alps have long contributed to the fantasies of people confronted with the anguish of change. They have served as an area for soul-searching, adventure, hiding, fleeing, isolation, as well as for exchanges, meetings and protection where outcasts and deviants could find a safe haven from the world. 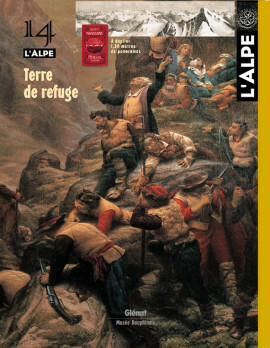 The Vaudois rebellion, still a living phenomenon in a few valleys of the Piedmont, found in the Alps its promised land. Marked by violent events and exodus, the history of this religious revolt, fairly similar to Protestantism, is still today obscured by a veil of mystery. As are the reasons for the movement’s settling in the mountains. An ideal society, composed of free and equal citizens, united in evangelic fraternity. That was the idea preached by Dolcino, who had revolted against the all-powerful clergy during the 1200s. An idea very close to the aspirations of the Alpine populations. Having taken refuge in the Piedmont, Dolcino found support among the mountain folk who had risen up against the feudal powers of the time. In the Tyrol, Andreas Hofer is considered a national hero. In the mountains overlooking Innsbruck and with the help of his peasant friends, he courageously defended his liberty against Napoleon’s troops by making intelligent use of the terrain and calling on the unflinching patriotism of the mountain population. A symbol of Tyrolean resistance and independence. Absent without leave according to the army, having deserted in the name of the Bible, the Berthalon brothers fled in September 1914 to the Alps to escape the coming slaughter. Their flight was made possible by their in-depth knowledge of the Alpine environment and the complicity of the local inhabitants. Théophile and Félix were arrested in 1927, after thirteen years of a precarious existence and extreme deprivation. In the fight against the Nazis, the dissident youth in 1943 took advantage of the protective geography provided by the Dauphiné mountains to hide, avoid the obligatory work service in Germany and take up arms against the occupying forces. The Vercors, Oisans, Belledonne and Chartreuse were thus the cradle and the grave of the Résistance. Historian Marc Ferro, political scientist Simon Nora and photographer Marc Riboud all took part and recount their experiences here. At the far edges of Morocco, in the Sarhro djbel, the Aït Atta Berbers were the last to resist the French troops sent in to « pacify » the protectorate. Today, these proud shepherds transhume their sheep through the austere, ochre mountains to escape the rigors of the winter in the High Atlas. However, the snow still catches up with them occasionally under the palm and almond trees, just steps away from the dunes of the Sahara. Antonio Placer claims Alpine roots and notes, « My songs are a Dauphinois dish with lots of spices ». The artist from Galicia waited until the birth of his daughter (and a chance encounter with the Rigodon) before finally deciding that the Alps truly were his new homeland. A minuscule warm nest amid an ocean of rock and ice, high-altitude refuges are a haven of peace to defy the demons of the cold night. These timeless shelters provide a reassuring halt on the trail to the summits and fascinate mountaineers. But for how much longer ? Take in a multitude of virgin summits and unveil their secrets in a single glimpse, that was the fascination of the panoramic brochures of the 1800s, when the Alps became fashionable. Somewhere between a romantic portrayal and the precision of an encyclopaedia, both a source of knowledge and a means to promote tourism, panoramas played an important role in presenting the Alps. As is made clear by the exhibition at the Museum des Alpenvereins in Innsbruck.